BIOS-SCOPE cruise photo. Back row, left to right: Chip Maxwell (University of Miami), Elizabeth Harvey (University of Georgia), Miguel Desmarais (BIOS intern from University of British Columbia), Katelyn McLeod (BIOS intern from University of Guelph), Steve Giovannoni (OSU), Craig Carlson (UCSB), Jimmy Saw (OSU), Zach Landry (OSU). Front row, left to right: Elizabeth Halliday (BIOS), Shuting Liu (UCSB), Krista Longnecker (WHOI), Winn Johnson (WHOI), Nicholas Huyhn (UCSB) Thais Bittar (University of Georgia), Leocadio Blanco-Bercial (BIOS). 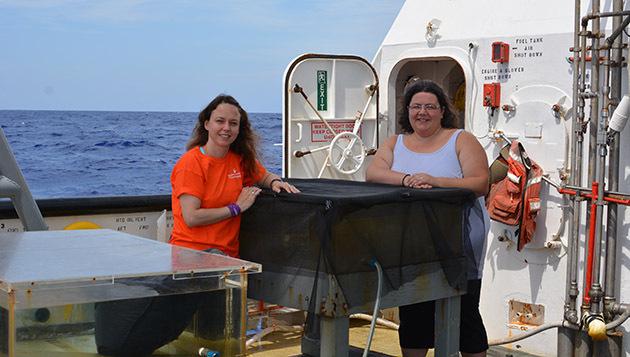 An interdisciplinary team of scientists joined forces in July for their first annual research cruise dedicated to revealing how specific microbes take up and transform organic matter within a web of ecological interactions in the waters southeast of Bermuda. 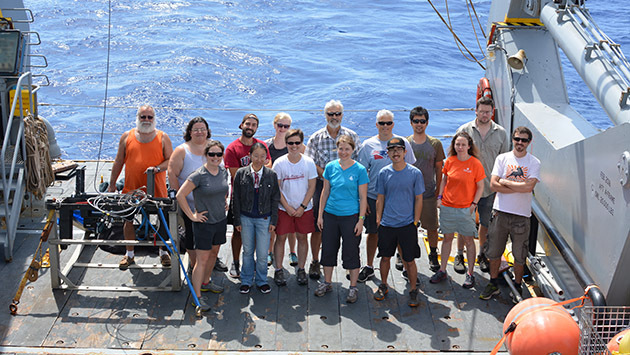 These oceanographers, molecular biologists, and marine chemists are working together to study the microbial ecology of the Sargasso Sea through the BIOS-SCOPE (Bermuda Institute of Ocean Sciences – Simons Collaboration on Ocean Processes and Ecology) program, which was established in 2015 thanks to the support of Simons Foundation International. In the Sargasso Sea, an astonishing array of single-celled, microscopic organisms are locked in competition to consume limited nutrients. These microbes grow so rapidly and are so abundant that their demand for nutrients changes the chemistry of the ocean on a scale that impacts Earth’s climate, and the invisible chemical transactions that occur as they grow, eat, and get eaten can ripple up the marine food chain. To explore these ecological processes, the BIOS-SCOPE program assembled scientists from three countries representing BIOS, the University of California Santa Barbara (UCSB), Oregon State University (OSU), the University of Georgia, the University of Exeter, and the Woods Hole Oceanographic Institution (WHOI). They are collaborating to discover the identities of microbes, zooplankton, and the chemical compounds they consume and produce on a daily basis. By sampling day and night on this cruise, the team hoped to capture how microbial communities respond to daily environmental changes. Broadly speaking, warm surface water and cold deep water provide habitats that support unique microbial communities. However, physical phenomena like mixing, internal waves and storms in the ocean can reshuffle habitat boundaries and community members. Larger forms of marine life can also impact microbes in the ocean, as animals take in food and oxygen and generate waste. Like airplanes that leave contrails in the sky, scientists suspect tiny crustaceans leave trails of waste as they swim up and down in the water every day, redistributing nutrients and creating transient smorgasbords for microbes. While monthly BIOS-SCOPE samples have already been collected in collaboration with the Bermuda Atlantic Time-series Study (BATS) site, the four days aboard the research vessel Atlantic Explorer in July afforded an opportunity for intensive sampling at Hydrostation 'S', where physical processes have been monitored biweekly since 1954. 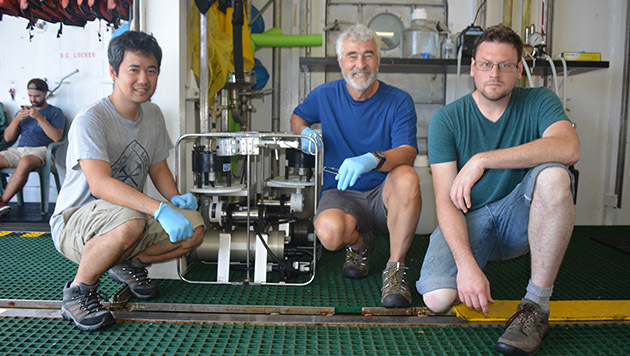 Every six hours, the BIOS-SCOPE team collected seawater using the Conductivity-Temperature-Depth (CTD) rosette, an instrument rigged with a ring of 24 bottles that is lifted and lowered repeatedly from the side of the vessel to gather samples. Each bottle can be triggered to capture about three gallons of water at a particular depth, and the BIOS-SCOPE scientists sampled from the surface down to 0.62 miles (1000 meters) deep. 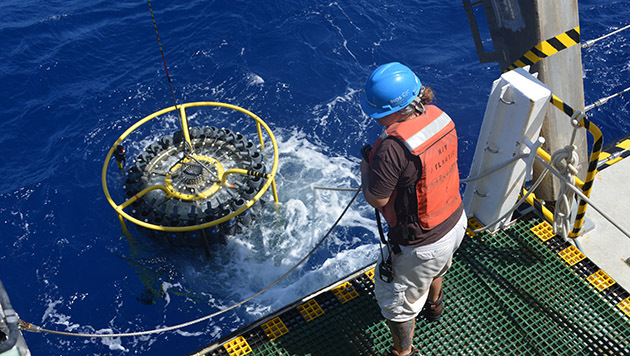 When the CTD rosette returns with its payload of water, it also has data documenting the environmental conditions for each bottle of water. Back on deck, researchers wearing Nytex gloves buzzed around the rosette’s bottles, tapping water from different bottles for processing according to the specialized methods of their field. Microbial oceanographers filtered the tiniest cells from the water for future DNA extraction and analysis. Marine chemists treated the filtered water with acid to trap dissolved organic compounds in resin columns. Some water was shuttled off for incubation experiments on deck, to observe how fast phytoplankton at the base of the food web grow, and to document bacterial community changes over time. Simultaneously, a trio of remotely operated gliders (known as Anna, Minnie and Jack) cruised up and down through the nearby water to record changing chemical and physical parameters. While Anna and Minnie flanked the ship, Jack mirrored the path of zooplankton nets towed behind the ship. Back on shore in the MAGIC lab at BIOS, physical oceanographer Ruth Curry monitored and adjusted the gliders’ courses. Over breakfast each morning she downloaded the newest data, transmitted via satellite each time a glider surfaces, to plot the data and monitor their progress. 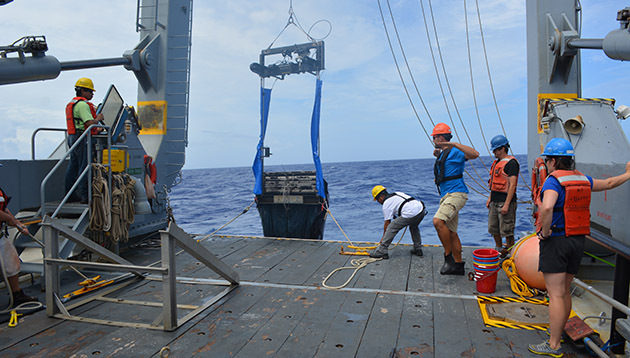 It was a testament to good planning, and the professionalism and dedication of marine operations and the Atlantic Explorer crew, that the complex sampling regime went off with hardly a hitch, said Craig Carlson, a UCSB professor and BIOS adjunct scientist who leads the BIOS-SCOPE program and served as chief scientist on the cruise. 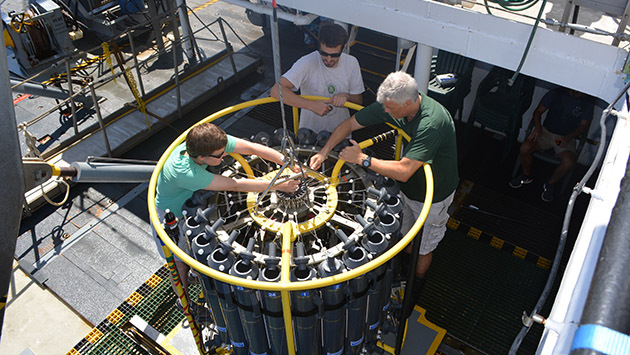 Scientists Krista Longnecker (WHOI), Leo Blanco-Bercial (BIOS), and Craig Carlson (UCSB) prepare the CTD for deployment. Photo by Jorge Sanchez. Carlson is no stranger to the Sargasso Sea. He first arrived at BIOS in 1987 as a volunteer college intern, and grew deeply rooted in Bermuda both personally and professionally as he married a Bermudian and spent much of his career as a microbial oceanographer working at the BATS site. A recent award from the Association for the Sciences of Limnology and Oceanography recognized the wide-ranging impact of Carlson’s research on marine microbial communities and their role in cycling dissolved organic matter. Dissolved organic matter, often referred to as “DOM”, is a catch-all term for tens of thousands of unique organic molecules that abound in seawater but are too small to be caught on a filter. On a global scale, DOM plays an important role in the carbon cycle: the amount of carbon contained in the ocean’s DOM rivals the amount of carbon stored in atmospheric carbon dioxide, and a portion of the ocean’s DOM that is unpalatable to microbes can be stored in the deep sea for thousands of years. But much of the ocean’s DOM gets broken down when bacteria eat and respire. (Like humans, many marine microbes take in oxygen and produce carbon dioxide as they extract energy and nutrients from the food they eat). To complicate matters, microbes eating DOM also often release DOM. Some microbes synthesize and emit organic molecules as chemical signals to others of their species, and most microbes discharge waste products that return to the pool of DOM, albeit in a new form. Carlson observed that DOM builds up in Bermuda’s warm surface water every summer as it apparently escapes consumption by the complex bacterial communities. When winter mixing transports that surface DOM to deeper waters, a different microbial community emerges, and the DOM disappears. But Carlson is still searching for the “smoking gun” to pin down which microbes acted on the DOM, and how they might have made it disappear. To quantify the chemical makeup of the DOM, WHOI chemical oceanographer Liz Kujawinski’s lab of “molecule hunters” will be analyzing BIOS-SCOPE samples using two high-resolution mass spectrometers. One mass spectrometer is calibrated to positively identify specific known metabolic products, and can calculate their precise abundance within a sample. The second mass spectrometer catalogues molecules, known and unknown, based on their unique masses and chemical properties. The two methods complement each other, and tracking the thousands of unique molecules in DOM samples collected at different depths and over several days provides a new window into how organic matter is transformed at the site. On the cruise, Kujawinski’s team worked around the clock to process DOM from the six-hour surveys, which will positively identify “what” was in the water. Steve Giovanonni’s OSU team of microbiologists filtered the same samples for bacterial community DNA analysis, which will positively identify “who” was in the water. Both labs are using technology that will answer these questions with higher resolution than ever before. Meanwhile, Carlson’s group carried out shipboard experiments to pin down how this happens by feeding bacteria chemically-labeled DOM. Back in California, they had created their own trackable DOM by growing phytoplankton on a diet of “heavy” stable isotope carbon-13. These phytoplankton were then sheared and blended so the cells exploded and their amino acids, carbohydrates, lipids and DNA spilled into a soup of “heavy” DOM that will be further characterized by Kujawinski’s group. On the ship, natural bacterial communities from the water samples were fed the “heavy” DOM, which will either be incorporated into the bacteria that consumed it (revealing the species at work), or transformed into organic waste products (revealing the metabolic processes the bacteria used). Thais Bittar and Liz Harvey (from the University of Georgia, Skidaway Institute of Oceanography) on deck with their incubation experiments. Photo by Jorge Sanchez. Understanding how bacteria grow is one aspect of the BIOS-SCOPE project, but the flip side of the coin is understanding how they die. Every day, single-celled microbial predators crop down and chew up bacteria and phytoplankton, releasing DOM in the process known as grazing. “We think grazers can fundamentally change microbial community structure, processes, and biomass,” said Carlson. Inviting Liz Harvey out to study grazing helps fill in one of the missing pieces of the puzzle, he said. “We like to joke that we’re the death lab,” said Harvey, assistant professor at the University of Georgia’s Skidaway Institute of Oceanography and this year’s BIOS-SCOPE visiting scholar. Harvey is interested in how classical mortality interactions, like predator-prey relationships and parasitism, happen among phytoplankton and bacteria in the ocean. On this cruise, her lab conducted incubation experiments to calculate how many phytoplankton get eaten by other microscopic predators, and how many die from viral infections. “We hope these specific rate measurements will enhance our ability to predict how the system changes over time,” Harvey said. The MOCNESS is hauled back up on deck after several hours of sampling. Photo by Jorge Sanchez. Every day as the sun rises, copepods the size of a pin head and shrimp the size of a pinky finger swim hundreds of meters deep, where they can rest in the cool dark out of sight from their visual predators. Then as the sun sets, they swim back up to the surface to graze upon the lawn of phytoplankton freshly grown in the sunlight. Maas’s collaborator and husband, BIOS scientist Leo Blanco-Bercial, was on the cruise collecting zooplankton to preserve for genetic identification. Their data will help illuminate how migrating zooplankton may produce DOM at different depths each day. (Before the Atlantic Explorer pulled away from the dock in St. George’s, they joked that Blanco-Bercial’s intensive day and night sampling regime might still allow for more sleep than their baby son’s routine at home). Catching zooplankton as they migrate through the water requires stealth and precision. Unlike microbes, zooplankton have eyes and can see (and try to escape from) a net coming for them, so the long nets are dyed black to blend in with the dark environment. A single net dragged from the deep to the surface would aggregate all the organisms together, but scientists are often interested in seeing the distribution of different species at distinct depths. The nine nets of the Multiple Opening/Closing Net and Environmental Sampling System (MOCNESS) are the answer to this sampling quandary. Each net has a separate mouth that opens and closes on command. The environmental sensors on the instrument help scientists understand the characteristics and volume of water filtered through each net. Chip Maxwell, a MOCNESS technician from the University of Miami, joined the cruise to help Blanco-Bercial and the Atlantic Explorer marine technicians deploy the multipart instrument. After the MOCNESS was hauled back up on deck, the contents of each net were emptied into a sieve. Like a prospector looking for flashes of gold in the pan, Blanco-Bercial cast his eye over the mess of small crustaceans and gelatinous debris. He pointed out what look like grains of sand but are actually globular, bubbled shells built by minute single-celled organisms; iridescent blue copepods refracting sunlight like tiny jewels; flat, transparent, leaf-shaped larval eels; and slick, dark viperfish from the deep, with distensible jaws lined with fangs and tiny bioluminescent stripes under their eyes like the inverse of a football player’s eye black. Blanco-Bercial picked out unique specimens for a quick examination under the microscope, then plunked them into the carefully labeled jar of preservatives where they wait to be counted and genetically analyzed. Ultimately, every organism is important to Blanco-Bercial and the BIOS-SCOPE team. Taken together, they constitute the eating, breathing, and waste-producing community of animals inhabiting a particular depth at a particular moment, producing DOM and influencing the community of microbes that live and die there. Steve Giovannoni (center) and team Jimmy Saw (left) and Zach Landry (right). Photo by Jorge Sanchez. Around the world, scientists are now conducting “microbiome” studies in which entire communities of microbes, such as all the microbes that inhabit the human gut, or the underground subway system, are studied by extracting and sequencing their DNA. Giovannoni named the bacteria SAR11, to designate the 11th sequence picked from the Sargasso Sea, and following its discovery in 1990 the SAR11 sequence started turning up in seawater samples nearly everywhere they looked. Over time Giovannoni and his team figured out how to grow SAR11 in the lab, sequenced and analyzed its tiny but efficient genome, and discovered SAR11’s economical ability to harvest energy from light while consuming DOM for food. Further studies revealed SAR11 thrives worldwide, with up to half a million SAR11 cells inhabiting a drop (1 milliliter) of seawater. If you could gather up the world’s SAR11 cells and put them on a scale, they would outweigh all the fish in the ocean. Scientists are still discovering the many ways that SAR11 influences the ocean’s chemical cycles, due to their impressive numbers. While SAR11’s tiny size and streamlined genome are exquisitely adapted to life in the ocean, there are some cellular features SAR11 shares with nearly all bacteria. One bacterial trick that is of major interest is their ability to swap DNA with other organisms. Like other bacteria, SAR11 maintains sections of its genome that can quickly morph to meet the demands of a changing environment. With advances in sequencing technology, it’s now possible to sequence the entire genome of a single SAR11 cell, offering insights into regions that rapidly evolve as well as the stable sequences used for identification. Sequencing the genomes of many SAR11 cells could catch how those rapid changes ripple through a population. “Until now, it’s like we’ve been taking snapshots,” said Giovanonni, “but to see rapid changes to the genome, we need to assemble a movie.” With collaborators at the U.S. Department of Energy’s Joint Genome Institute’s powerful sequencing facility, that is exactly what they plan to do with samples collected on this cruise. Rachel Parsons, who manages the BIOS-SCOPE program and Microbial Ecology lab at BIOS, was busy shipping samples back to labs across the United States in the week following the cruise. Like the other scientists involved, she is eager to get past the time-consuming but necessary cruise logistics, and get time on the microscope to start analyzing the samples. “For now, our work in the Microbial Ecology lab is to see who is out there, how many there are and how fast they are growing,” Parsons said, “but it’s going to be very exciting to see the story come together using bioinformatics and the high resolution DOM measurements.” Ben Temperton, a bioinformaticist at the University of Exeter in the United Kingdom, will be helping to analyze the massive amounts of sequence data generated by the project. Significant computing will be needed to connect shifts in microbial DNA sequence data with the other measured oceanographic variables including the rich chemical context generated by the Kujawinski lab’s high-resolution data, and the physical and sensor data from Ruth Curry’s gliders. When the glider Jack returns from his mission at the end of August, his Acoustic Doppler Current Profiler (ADCP) will provide another valuable layer of information about the structure of currents, particles, and zooplankton in the water based on how they reflected sound waves back to the instrument. Already, Curry can see some clear day-night signals in the data from the other sensors on the gliders. “This is a great opportunity to try to understand what those signals are by adding the biological context to the physical data,” Curry said.